Peanut soup is something I’ve always wanted to try, so when we visited my parents in South Carolina, I picked up two bags of raw peanuts in the shells and had a fun afternoon shelling with the boys. I set out a half-sheet baking pan and gave each of the boys a pie pan, and we shelled while telling jokes and making up stories. It took us a while but made for fun weekend family time. After shelling the peanuts, we roasted them in the oven and let them cool. 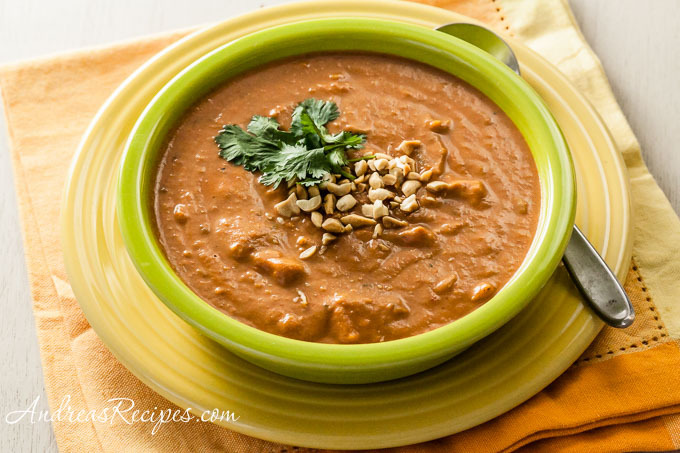 Most peanut soup recipes call for peanut butter, not peanuts, and you can use purchased natural butter, which works very well for peanut soup, or you can make it yourself as Hockey Guy demonstrated last year with our homemade peanut butter. The flavor is excellent and much healthier than the ultra-processed stuff in the stores. 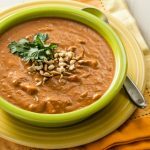 The thing we love most about this peanut soup is all the flavors: curry, sweet potatoes, and tomatoes. It’s a great mix and a super healthy vegan soup that’s warm, cozy, and filling. Top it off with chopped peanuts and cilantro for extra crunch and fresh flavor. Assign the simpler tasks, such as baking the sweet potatoes, to the younger kids, and save the more challenging tasks for the older kids and adults. Young children should be supervised when using a food processor and blender. Scrub the potatoes well and prick them in 5 to 6 places with a fork. Microwave on high until just cooked through, about 7 to 10 minutes. Set aside to cool, then peel and chop into bite-size pieces. Meanwhile, heat the oil in the large saucepan over medium-high heat. Add the onion and sauté until it just begins to brown, about 2 to 4 minutes. Add the garlic and stir for 1 minute. Stir in the diced tomatoes, curry powder, and salt. Adjust the heat so it boils gently for about 10 minutes. Add half of the sweet potatoes to the pot and stir. Puree the rest of the sweet potatoes with the broth and peanut butter until completely smooth. Add the puree to the pot and stir well to combine. Season with pepper and cook until hot. Serve with cilantro and chopped peanuts. Sweet potatoes are either loved or detested. If you don’t like sweet potatoes, butternut squash makes a good substitute. Slice off the stem and bottom and cut the squash in half from top to bottom, then scoop our the seeds and stringy bits. Place the squash halves face down on a baking sheet lined with foil and coated with cooking spray. Bake in a 400° F/200° C until the skin is brown and can easily pierced with a fork, about 45 minutes. Allow to cool until you can handle it without burning your fingers, then scoop out the flesh. Set some aside to puree and cut the rest into chunks. 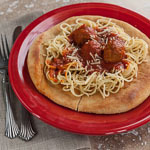 Visit our Cooking with Kids page for more recipes the whole family can cook together! Your soup looks wonderful and thanks for linking up mine at the end of your post! Hi Averie! Thank you, love the flavors in your soup. Oh yes please! 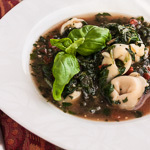 I love everything about this soup, and thanks for the mention. Hi Kalyn! Your idea to do it in the slow cooker is great. This sounds amazing. I’m a huge curry girl, so right up my alley!! Hi Marie! 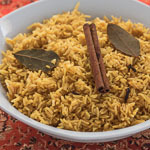 Curry is one of the most-used spices in my kitchen. Andrea, this sounds and looks amazing. I would have never thought to toss peanuts into the mix but I love the simple Asian flair it gives the recipe. Adding this to our winter menu list. And, I love the cooking with the kids on Monday. Adorable and fun! Hi Denise, long time! The boys love helping with The Kids Cook Monday posts, they always have a good time. This is my new favourite soup! Ive made three batches just this week! Thank you so much for the recipe. Wonderful! I am so glad you like it, Nicole. S&B curry is the best!! This soup sounds great, I would probably add chicken because it reminds me of a really good chicken peanut soup I had in the past.